When I prayed to God about what I should blog about today, his answer was my lymphedema. I smiled and felt at peace with His answer. For the past week since I blogged about living with lymphedema for the very first time I have received so much feedback and support. I cried so many tears of joy and gave so many women hope that they don't have to feel boxed in from revealing to the world that they too live with lymphedema. 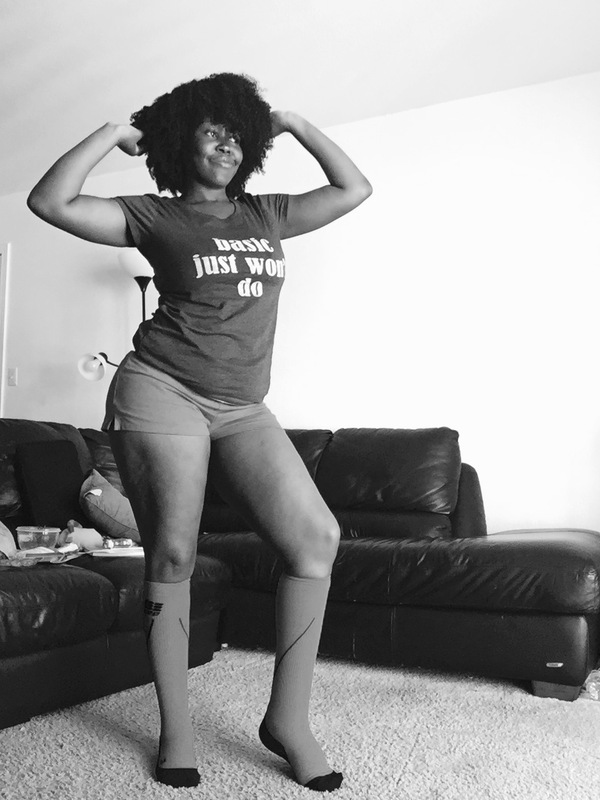 In this blog post, I want to share with you the ways in which I have been managing my lymphedema for the past 10 years especially during the summer months. I am a 25-year-old woman who lives on the west bank of New Orleans, Louisiana. I live in a very hot and humid climate for the most part, especially whenever it isn't pouring down raining or the mosquitoes and termites are out. I have always lived a very active lifestyle for many years. I love wearing shorts more than dresses, and with lymphedema, I have found ways to still have radiant skin and legs. Every morning, I reach for my dry brush after prayer and dry brush my legs and feet. If you don't know how to dry brush or never heard of it before I will link this video to help and aid you. Dry brushing has helped me to keep the lymph flowing and over time (I stared dry brushing in February.) has given me less swelling to deal with and a noticeable glow to my legs without applying anybody creams, body butters, or lotions. I dry brush anywhere from 5 to 10 minutes before placing on my compression socks. Notice, that I said nothing about applying anybody cream either. I then place on my compression socks for the day. I normally wear 20-30 mmHg, however, I am gradually making the switch to 30-40 mmHg compression socks for a tighter fit. I love using the MediUSA brand of compression socks. I always place money on the side, so I can get a quality pair of compression socks. I used to purchase random brands from eBay and saw no improvement in the swelling in my left ankle that was very noticeable. Having a few pairs of very durable and breathable compression socks are key! The MediUSA brand has a wide array of colors, styles, and comfort levels that really help with my lymphedema. I wear my compression socks underneath yoga pants, jeans, slacks, and even with gym shorts. 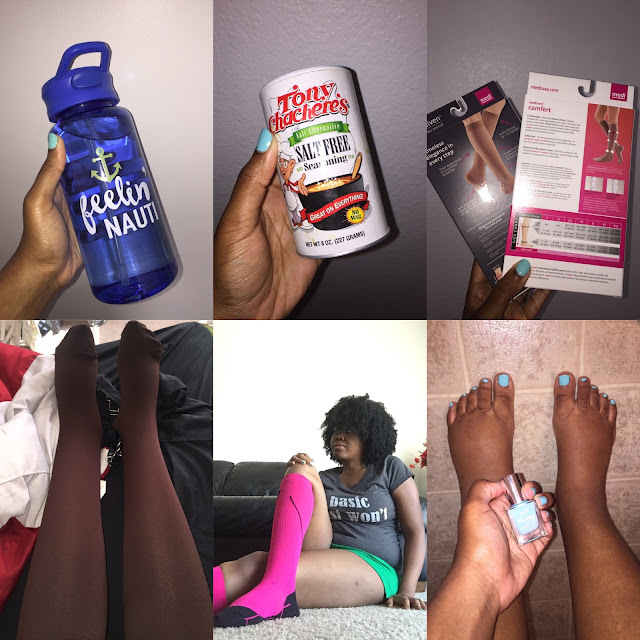 I really love purchasing bold color compression socks to wear around my home or while walking around the track to burn calories. Drinking over 64 ounces of water a day has also helped me manage my lymphedema. I am also breastfeeding too, so I try to drink close to 80 ounces of water a day as well. Staying hydrated will keep your body functioning properly and your lymph to flow easier. I also try to stay on a low salt diet. Of course, I love my crawfish, fried catfish/chicken, and an occasional dash of salt on my watermelon. I do try to limit my salt intake for the day and even for the week. I'm far from being a bland girl with the taste buds to match. I love using this Tony Chachere's Salt-Free Seasoning with a passion. If you try it or even have it in your pantry then you know it's amazing for many dishes! Thank me later if you try it out, but please use it in moderation. Another way, I manage my lymphedema is by giving myself pedicures. If you would love to see a video or blog post about my self-care pedicures, then please let me know. Doing my own pedicures give me a boost of confidence. I never had a professional pedicure in my life. I always been the one to shy away from them and rather do them myself. Manicured toes with hydrated heels and feet in a cute pair of sandals always make my summers feel so much better. I also do wear my feet out! I know there's a lot of speculation on whether it's safe for many who live with lymphedema. I occasionally wear my toes out during the day. At night time, I am back to dry brushing whenever I get out of the shower and out of my compression socks for the day. When it comes to the radiant skin I also use the loofah gloves in the shower and a body brush to scrub my body with Dove original soap. I do shave my legs with soap and I do it very carefully in the shower especially if I'm not using my Nair. After showering and shaving I sometimes follow up with using Aloe Vera on my legs and feet or even Vaseline to hydrate my skin. I love using my DIY whipped shea butter and good ole unrefined coconut oil on my toes and cuticles. Managing my lymphedema has not kept me from feeling beautiful. In fact, managing my lymphedema and discovering more and better ways to do it is refreshing to me. I am learning more about bandaging and doing the lymphatic massages for myself. I would love to even get a lymphatic massage done soon. I will share with you the shoes that I wear and that I will be purchasing in a future blog post. I hope that I have inspired someone today to take charge of their lymphedema or even their health. Feel free to comment and reach out to me with any questions, comments, or concerns. I will be recording a YouTube video on and about my lymphedema journey soon too. Love you and take care! *I also elevate my feet daily as well. I admire you for telling your story and showcasing your strength. God bless you during this journey!